Making chocolate fulfills a lifelong passion for turning high quality, sustainable, organic, raw ingredients into a product which stands for taste, health and nutrition. I am wildly excited to be able to share with you an ever-growing range of delicious unroasted, organic, handmade, dark artisan chocolate bars Each bar we create draws on the delicate flavour notes of the cacao and our unique blend of natural organic ingredients. To make great tasting chocolate with your wellbeing and the planets wellbeing in mind. Making chocolate fulfills a lifelong passion for turning high quality, sustainable, organic, raw ingredients into a product which stands for taste, health and nutrition. I am wildly excited to be able to share with you an ever-growing range of delicious un-roasted bean-to-bar, dark artisan chocolate bars. All Aztec Gold's handcrafted chocolate is vegan, free from soya, free from dairy and gluten free; we do not use processed white sugar and there is not a GMO in sight. When it comes to making great chocolate there are two main criteria: the best ingredients in the world and the best execution. At Aztec Gold Chocolate we source the finest, most delicious criollo cacao beans from small scale farming cooperatives in Peru, we use only organic produce from ethically-sourced sustainable practices. We are committed to using organic, natural ingredients and no preservatives which allow us to make the finest and most deliciously healthy chocolate possible. Our dark chocolate bars are sweetened using unrefined organic coconut sugar from Indonesia; supporting fair-trade wages and sustainable agriculture. All our chocolate is produced at low temperatures in micro-batch stone grinders using un-roasted cacao beans. This gives the chocolate a unique and distinctive flavour. Aztec Gold has developed a selection of exceptional dark chocolate bars that not only look great, but taste amazing too. We are a small company and proud to be one of the few handcrafted, bean-to-bar, single origin chocolate makers in the United Kingdom. 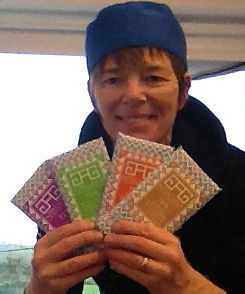 Artist Timna Woollard has teamed up with Aztec Gold Chocolate to create beautiful wrappers for our chocolate bars. As a company committed to sustainable practices we use only biodegradable, compostable or recyclable packaging. Emma, the founder of Aztec Gold Chocolate, labours over every individual detail, constantly striving to improve her craft. She conceives, creates and packages everything by hand. You will not find any industrial machinery here. Aztec Gold Chocolate is one of life’s great luxuries - Perfect for You - and Perfect as a Gift.